Here at C L Promotions we believe that Christmas is important and with our Company Christmas cards you can make your customers feel important this season. 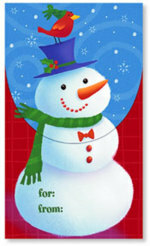 Each one of our Company Christmas Cards come signed with your business details and company logo. Click to view our Company Christmas cards range, then let us know your favourite designs. Make your customers and friends feel special this year and send them our Company Christmas cards. Other promotional and personalised items besides our Company Christmas cards click here. To find out more about our Company Christmas cards click here and fill in the contact form and we'll get straight back to you.